We read a lot, and the media is reporting a calming between China and America. We are of the opinion that no such cooling is underway as we have seen no evidence other than reports in the media. They could be true or they could reflect the market’s newly found footing. The US yesterday and Asia today began buying in unison and the European markets just have to follow on to give battered traders the pause they have needed these last two months. The DAX has a bullish moving average crossover underway and looks like it will keep headed upwards to push though the 12332 resistance zone. This will reinforce confidence and make New York’s work easier. We are long the index looking to take some profits out at the 12305, 12340 levels with protective stops at 12203 – 12160. These trades are for the very short term only. This clutching on to current prices without falling has not been going on long enough to take positions out too far. Hourly end of day maximum. The 63.00 per barrel is under threat. No that this is any real bargain price. We feel that the price is still above what it would be were OPEC and its associated cartelists not keeping the faucets tightened. Still the fall is welcome ad solid we’re looking for profit on this trade in the 62.93 – 62.66 zone and placing stops between 63.32 and 63.41. This is now shaping up to be strong enough to carry on for a week or more. That is the outside on this trade. Daily to weekly positions are where we are positioned. For the fourth time since August Gold has attempted and failed to get above the 1356 price. It ain’t doing it. As its pride in dollars slides down, the value of the South African rand tends to inversely follow suit. We are long the USD ZAR for hour and end of day positons with our profit target at between 12.025 and 12.034 and stops between 11.998 and 11.981. Market stabilizing, Gold falling, Rand weakening. All of a piece. 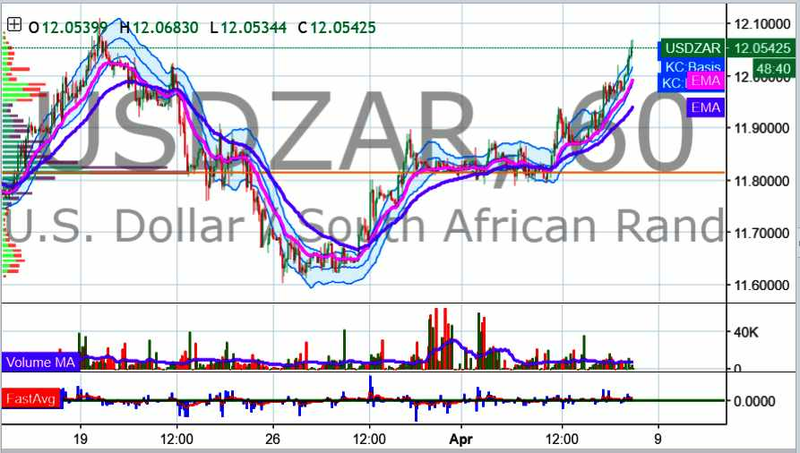 USDZAR UP. Next: How to See the Markets?